Stephen: A commission which is just bread and butter really, and I ended up using figurative work at a time I have been moving away from it to do more constructions. But I like to keep on going back to the figure because I kind of know what’s around the corner as I work: When starting a figurative sculpture I usually do a ‘drawing’ of one profile and I cut that out. Then I turn the thing over and I do the other profile…that kind of defines the work. From there on, I work from one plane to the next to build different surprises as people move around the sculpture. So it is not always what they expect. Though it is figurative and everyone has got an impression in their brain as what they are going to see around the corner, I like the surprise that you get as you move around the work. But the brain immediately corrects it for you and says “this is all correct”. Sometimes parts of the sculpture are still disturbing but if they keep moving, then something will happen and the brains says “that’s right”…..You put a few things in the right spots and everything looks right. So I sort of wonder if I am just playing with the brain, in the brain looks, the ways the brain sorts stuff out. Annabelle Josse: Are you saying that it is easier for you to do that with the figure compare to doing it with a construction work? Yes. I don’t find that joy with the constructions. With the constructions it becomes a slog, it becomes hard work. AJ: is it because you need to plan ahead more? Yep. And then you have to go away and you have to find a bolt or you have to find something to join it up and you’ve got to leave the dream to do something practical. Whereas, like a painter, I like that I can just keep on going with the figurative work: work on this one lump and let it…. just watch it change in front of me. But then also, I think I’ve got the joy of just being able to “trick” the viewers. They’ve got their first impression and then I get them to relook at the thing as they move around it. So that’s why the figurative works are more of a’dream it and make it’. The construction, after you have the idea, you have to go, plan and then make it. AJ: without moving too far ahead in our discussion: are you looking for something specific with your construction pieces? If you move in that direction it is surely because it brings you something positive…or is it just another challenge? Hmmm…I am kind of a builder. I have built this [showing the large shed /studio we are sitting in for our conversation]. 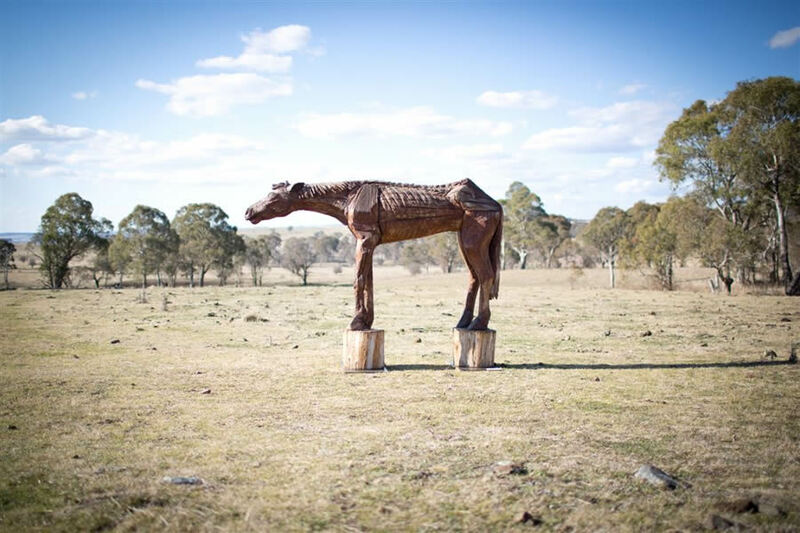 So some of the sculptures like the horse Bert in Tamworth are more of a construction-type sculpture [note: the horse is actually made of many parts that have been jointed together] . But I got around the problem of having to stop as I carve by doing all the construction upfront. Then I was freed up just to go ahead and do the carving,….and have the continuous joy, I suppose…. And wondering what’s happening next. AJ: so you assembled the pieces of wood first and then carved the horse?Yes. But I also like the assemblages and I enjoy architecture. So it comes out of going through building, phases, and sort of ‘solving the problems while you sleep’: you wake up next morning and you realise what you were struggling with for the last three days or so. You get the excitement when you get back to it, see it realised. Well, all the materials come off the farm and I am constantly looking for materials as I go around the farm anyway, doing work. I kind of know where all the material is: so I have got logs that I know would be appropriate if a job comes up or an idea comes up, and where I have to go for it. So really, the farm and I are totally hand in hand. In a way it is like the flow-form you saw [note: a construction that Stephen has built to produce biodynamic fertiliser for his land]. I think that is also why I wanted to go into biodynamic: because there is that art element in there, it is also a process. I often do etchings of mundane activities that I do on the farm…. Yes, slices of life…. Like a photograph. It’s like a photograph but I can put everything in and leave the stuff out that is not necessary. So that comes from the farm. But more often than not, the figurative stuff is just about humanity, I think, and about the way we think, like religion.There was quite a lot about religion in my earlier works. AJ: the place of us, and where we live. Yes and how we think and how we behave with each other. AJ: so does the wood triggers the idea or does the idea come first and then you find the piece of wood that you need to make it? Usually the idea comes first. Sometimes there may be a lump of wood that has a certain shape and an idea will come from it and then I might go away and find something that’s scaled up that I can actually use to do that idea…But generally I’ll have the idea and then go out and find the material. AJ: do you draw and sketch your sculpture before you start carving? Usually yes, there is a series of drawings. Then usually there is a series of studies and I’ll be driven to scale them up and to make them a bit over life size, thinking that they’ll work better on that scale. AJ: and the work may change from the small scale to the final work? In your Tamworth retrospective, I was interested to see the evolution from the small study of “Fallout” to the larger scale work that won you the prize at Sculpture by the Sea last year. The human figure disappeared as you scaled up. I don’t quite know why that happened but I could still ‘see’ the figure in the finished work…I don’t know why I changed my mind. I actually did a lot of life size studies for the figures and I was pretty excited about it then as well…. AJ: Looking at the small work vs the large version, I find that the figure “steals away” from the form in a way….the figure displace the centre of interest. Yes, I wanted to simplify that part of it. Also, the sculpture was strangely related to the atom: If you draw the nuclear power symbol, the way that I cut the log, if you saw it in cross section it was just like a nuclear power symbol! And I liked the way that the joiners would fit into that and you could keep on adding more and more. It ended that the more I took away the better it looked. And like you said, the top bit disappeared when the figures were involved. WHAT ARE YOUR INFLUENCES, AND WHY? ARTISTS THAT INFLUENCED YOUR YOUNGER YEARS? …Not so much…I had an art teacher who was pretty influential, he was mainly a painter and a bit of a printmaker too. It was easier to get into art school (Sydney College of the arts) as a printmaker, so that’s what I said I was…and I am pleased I did that too because it left me with a good understanding of the craft. 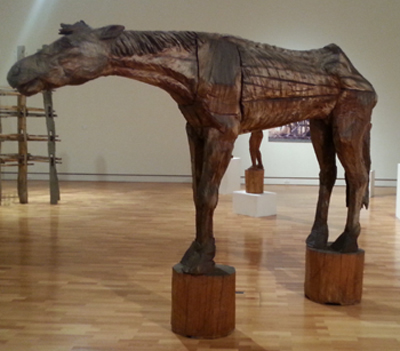 There is a wood carver in Melbourne called Mike Nicholls, he influenced my work. I have done very little life drawing and I can see I keep making mistakes with the figure, continually the same mistakes… but is has become a signature! That’s just how they look like when I deal with them. Even though they are figurative I am not obsessed with getting the accuracy. AJ: what interested you in becoming an artist? I enjoyed drawing as a child. I have a reading difficulty so I wasn’t much of a scholar. Both my brothers are but I was more interested in art, in making things. AJ: where you born in the country? Yes, then went to Sydney College of the arts, which was a conceptual art school. I never thought I would end up as a figurative wood carver…that is not where I wanted to go. But being at a conceptual art school I found it pretty annoying when the lecturer was suggesting we had to forget everything that has ever been learned about art, and that they would “teach us”. Having said that, I can’t just walk into the studio and start. I generally have to have the idea first, it has to have some base. AJ: do you create a work with a clear vision of where it should go, be displayed? Outdoor, indoor… does it matter?No, it doesn’t really matter. The size tends to dictate where it goes. Having said that a lot of the big ones look better inside. I find that outside, a work disappears, the life gets sucked out of it by the landscape. So when it is placed in a big white room there is less distraction. AJ: when you came back from overseas and started working on the farm, did that spark the move from printmaking to sculpting? Yes, I was mostly making prints. Then being here triggered something. I was working for my brother and I’d go working around the paddocks and I’d come back from doing a job, moving a mob of sheep or something like that and he’d say “how are the bulls ?” or “how is the fence?” and “what’s the water like?” …. and I’d never ever know! …because I’d spend all my time looking around for a nice piece of wood. So I did lots of joinery, I’d cut elbows out of trees and legs and that sort of things and did these constructions. Then I just started manipulating them and found I liked the dream of being able to not to worry about adding something new. So I would always carve out from a solid piece. So in a way being here has influenced the work …..yes, it has. WHAT IS THE PLACE OF THE FIGURE IN YOUR WORK? HOW DOES IT FIND ITS PLACE IN THE LANDSCAPE? A lot of the figure works I did were religious and I was more interested in where religion comes from and why we need it. It was mainly Eve and she often had the apple. I liked that symbol that men had used against women, of forcing ‘stupid Adam’ to eat that forbidden fruit! The figure ….well I think it represents our behaviour, I like them to have an ‘attitude’. But I also use the hands a lot, and I see them as figure. I find the hand really expressive and having a personality, whereas the figure doesn’t always have a personality. Sometimes I use the figure to deliver an idea, and sometimes I just use the hand, as the figure. And the hand is always doing something, but I don’t know why sometime I use the figure, and the other time I just use a part of it. AJ: but also it is not JUST the figure. 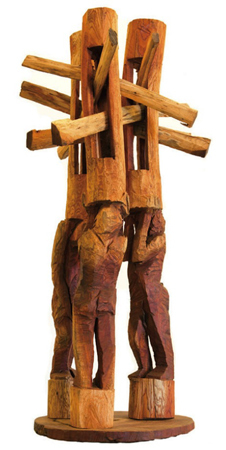 In many of your sculptures the figure touches a piece of wood…. it merges back within the wood. Yes. After all these religious things I was doing I realised that the figure interacting with another inanimate object, either a board or a spear, anything, gave it more meaning. Yes, that’s right, or maybe it is just from carrying that big piece of wood or rock! 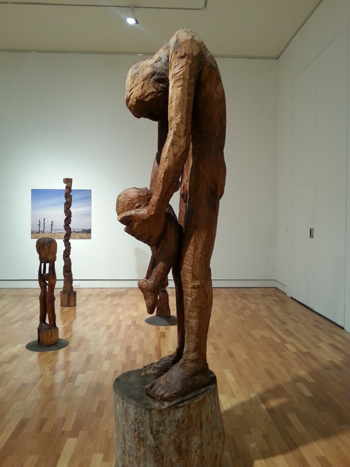 AJ: There is also this work where the figure is leaning his head against the wood….like against a wall. I had been using the figure holding an object, often just a huge plank or something like that. He would be either hanging of it, or carrying it or he’d be hiding behind it, or being part of it, or merging through it. Then I could have the hands as well. They could play their own games and you would come up to them as they weren’t very obvious. The viewer would wonder “what is this?”, then walk around and here is the explanation straight away….like a hieroglyph which secret is immediately given up. AJ: It makes me think somewhat of these Celtic stories where unmarried brides would get turned into a tree for ever, or even here the story of the Three Sisters turned into rocks, turned into an element of the landscape. In some ways, your figures are still very much part of the landscape because in them you can see the tree, still. Yes, I always want to keep the tree. 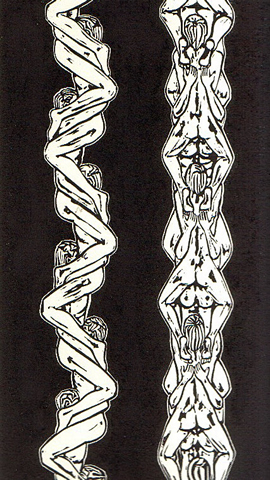 Like in those “Chain figures” I did, I wanted it always returned back to the trunk. Sort of like the edges of the painting….I am not sure why it was….For some reason I need it to reveal where the sculpture comes from. More often than not, the real information is just in the central part then it disappeared off into the future and back into the past, sort of like a timeline. I also wanted to have a certain appearance from a distance. It was covering the whole piece. And as you moved up, you would see the detail but still have the whole form there. 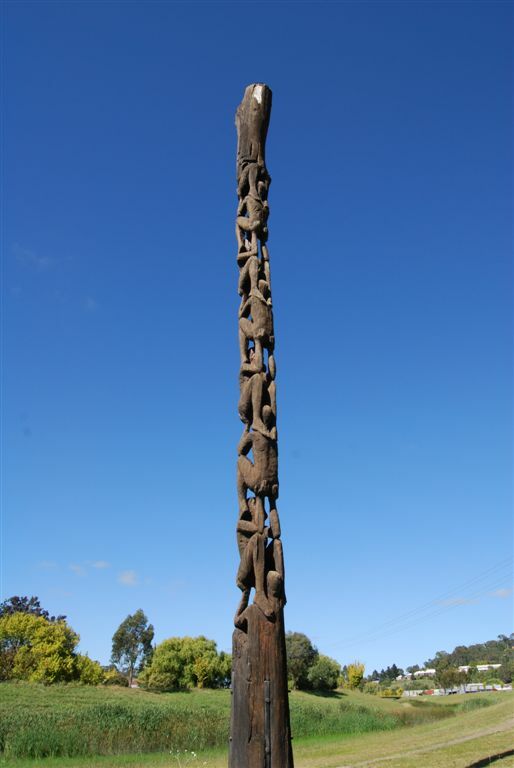 When I was a kid, I actually thought they were all aboriginal carvings! …. “Wood grub dreaming” I thought. It wasn’t until I lifted a sheet of bark off a log that I realised the aboriginals had already been there under the bark carving away!! [laughs] so I realised it wasn’t them. But I like these marks. Drawing attention to those marks might just be kitsch….really bad craft often leaves the pith and shines it off in a lacquer. Toying with bad taste and being anti-intellectual seems to reoccur in my work. Woodcraft earned a reputation for bad taste with its heavily lacquered emphasis on “interesting” stumps made into coffee tables. I didn’t receive it as corny at all if that is of any consolation. Yes, I see that as well. I enjoy commenting on human relationships and with Man and Child, the space between the man and the infant’s face becomes full of energy. Keeping the base is also convenient so I don’t have to use something foreign which ends up playing a role in the work. AJ: But you could have cleaned it. Hmmm. I could have cleaned it. WHEN WE BEGAN YOU MENTIONED THAT YOU WERE MOVING TOWARDS CONSTRUCTION WORKS: WHY IS THAT A NATURAL EVOLUTION? In an interview for the ABC, you also mentioned that you were commenting on humanity. Do you think that you are moving from being an observer of humanity to something else? 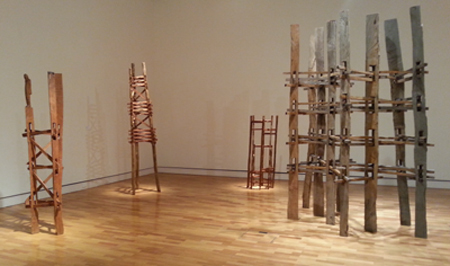 I almost see these as totally different work, it is a totally different approach. And I don’t think I am going into construction because I didn’t want to be pigeon holed. I just think this is what I have always been interested in and I have had ideas in the past that I haven’t actually used yet. I feel that even though it is less joy, I do like being able to wander around a three dimensional form and see it change shape in front of me. With the figurative stuff you really need to cut through, cut out, there’s got to be a gap below the arm, you’ve got to break through to keep the shape changing. The ultimate of that I guess is putting a whole lot of sticks together and just moving around and watching it change shape. The spaces open and close. AJ: you make it sound easy!….Do you suggest that the figure is limited to itself while the construction is without limit. AJ: so maybe it is just complementary rather than pure evolution? Yes, it might be…I was thinking that probably I would stop doing figurative work….but I just missed it too much. So I’d exhaust myself making ridiculously huge constructions and then for pleasure I’d have a series, like making these little painters wrestling with their canvases. … Like that one outside looking like a lament, wondering whether he has been a genius, taking a large breath before reassessing what he’s done, and realising that “oh no!, I am just a failure” or “I am just ordinary”. The constructions are modular. I enjoy the modular repeated thing. That’s why once you’ve worked out what your module is you just have to go ahead and make a whole lot of them. Then putting them together and changing them around can be fun although you should have worked that out in the study anyway because these pieces are so difficult to manipulate you’ve got to know where they are going to go! In your case, although you are not representing the landscape per se, your work is intimately linked with to it, to where you live and the material you use. From our conversation I don’t think you would make this kind of work were you to go back to the city? No, not even the constructions. I guess working out there, working in the landscape, when I sit them up they are always in the landscape. They always look strange when they are in a built environment but I think as long as the space around them is not too big they can still have some power, still be effective. And I don’t know whether that’s just the way the chainsaw makes marks, but they do look like they have come out of the bush. And they generally look like stands of trees even though they might be a triangle or a square. I like that there is an over story. So it is related to the tree again. I’d say my work is totally related to what I do and to the bush. I have planted thousands and thousands of trees, I do love them. 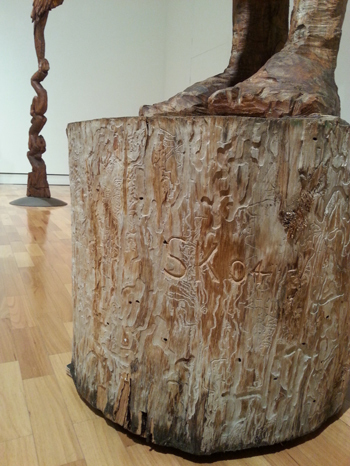 Stephen King started as a print maker and later progressed to sculpture. 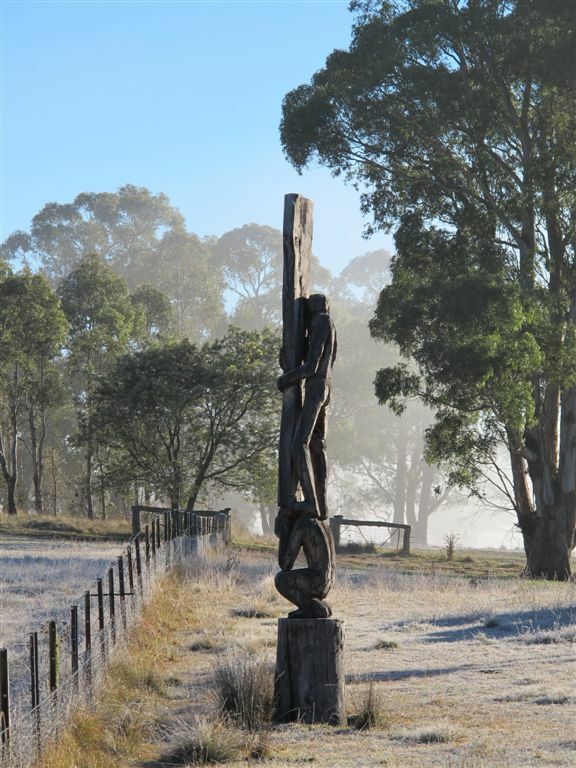 Artist and farmer in the New England region of NSW, his sculptures are made out of trees sourced from his land and carved with a chainsaw. 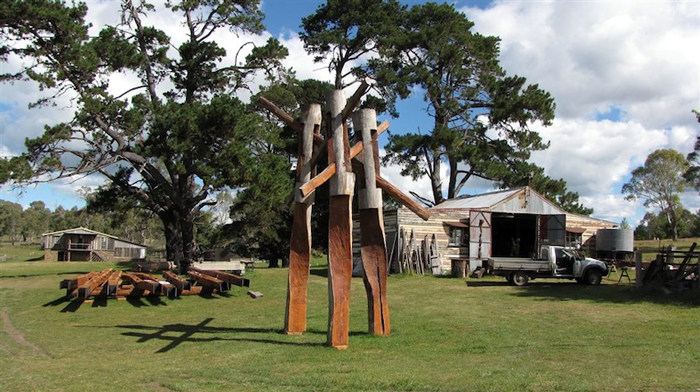 Selected to exhibit in 15 of the 17 Sculpture by the Sea exhibitions, he has won the prestigious prize last year with a monumental construction work “Fall out”.